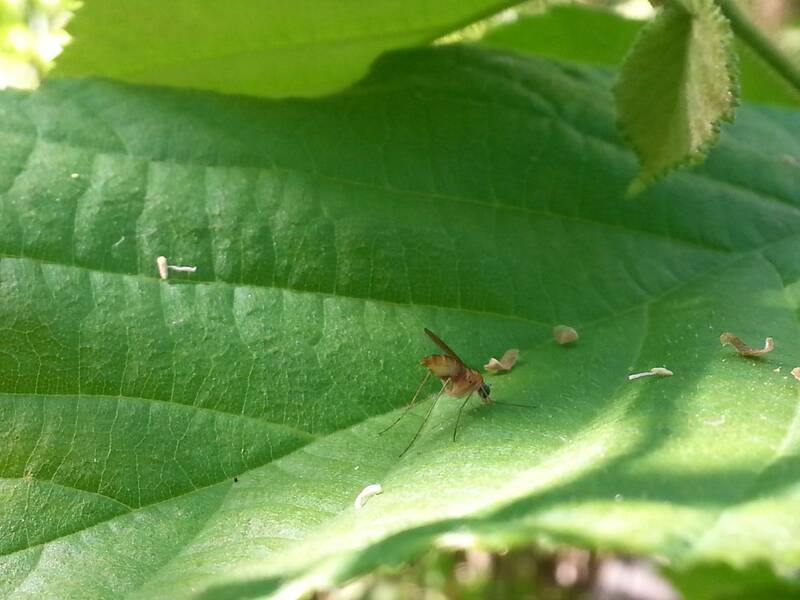 Who is this tan mosquito-like flying insect hanging on various tree leafs in zone 5 northeast USA? I grow potted trees in zone 5 of northeastern USA and spend time watching the nature around them. I have been trying to learn more about the insects that frequent the plants, whether for good or bad. In early summer I was regularly seeing the insect shown in photos below. I still see it sometimes, but not as frequently. I couldn't tell that it was hurting any leafs but it was putting its mouth to the leafs as if eating or sucking on something. Is it helping (protecting from other pests) or hurting (being a pest) the leafs? 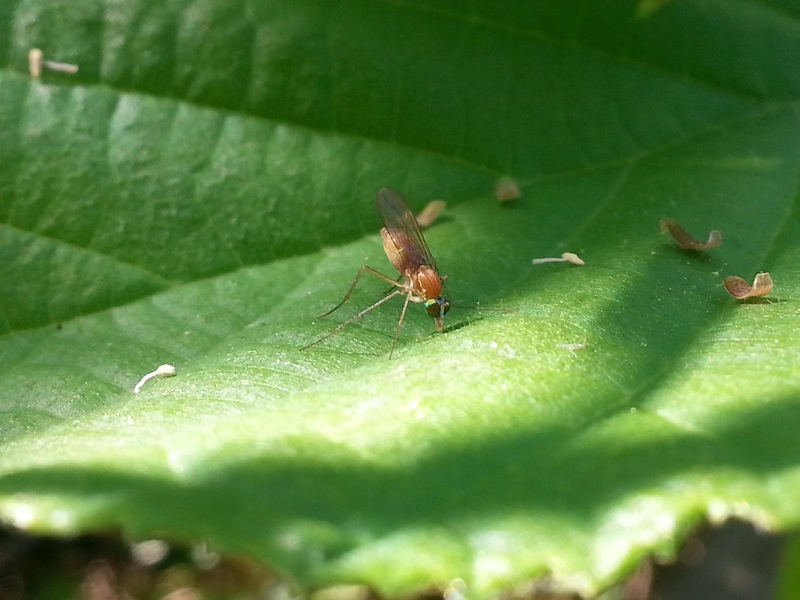 Its mouthparts and coloration are not like mosquitoes' but it otherwise its form is similar to one. It seemed to land on various leafs and trees in different areas of the garden but I noticed it most on hazelnuts (maybe just by chance). A related question, maybe better a separate question, is how do you learn all the insects that frequent your plants? Are there good resources or methods to ID insects in a garden? This is a tough one CrO. This guy could be a robber fly. I think this is a predator and a good guy. What bothers me is the fly in your pictures looks like it was laying eggs in those leaves. Such as leaf miners do. Check this article out and look up other pictures to see what you think. Not the answer you're looking for? Browse other questions tagged identification tree-care containers insects or ask your own question. How to get rid of insects on basil while leaving the leaves safe to eat? What insect/disease causes lemons to look like a Cthulhu and how can this be prevented? What is this tall tree with needle-like leaves? What is this beetle-like, brown-spotted flying insect? What is this moth-like bug on my tree? What is this small eucalypt-like landscape tree in California? What is this willow-like tree? Is this caterpillar-like insect a good guy or a bad guy? What is this tree that looks like an ash tree? What is this ladybug-like insect that is damaging my kale, and how can I control it?